I’m amazed how often I get asked this question. People either aren’t getting enough sleep or don’t sleep very well (meaning they don’t get good quality sleep)… Generally, my sleep has always been pretty good but recently, just before Christmas, I had trouble sleeping so I thought I’d investigate to try and improve my own sleep quality. Before I explain on how to improve sleep let me explain why good quality sleep is so important. Basically, when we sleep our body does all it’s housekeeping. It removes toxins that have built up during our day, from your body and your mind (brain). It repairs over worked muscles, organs and blood vessels. It helps with digestion, immune system function and stabilises your blood sugar. Lack of quality sleep is linked to heart disease, weight gain, depression and general lethargy. Only £3 on Amazon, what a bargain! I came across this book (see above) and I have to admit, it solved my own sleeping problem. It also gave me plenty of food for thought. It’s easily the best book I’ve read on the subject and I can’t recommend it enough. 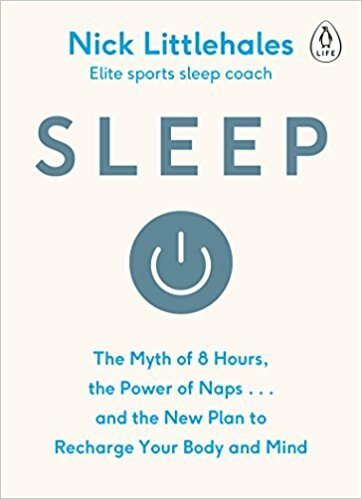 The author, Nick Littlehales - Elite Sports Sleep Coach has advised many top sports teams, athletes and business executives. You realise very early in the book that he really knows his stuff. I’ve summarised the changes that I made (mostly from the book but from some other research too) and hopefully the information and guidelines will be of interest to you. How long is a piece of string? It all depends on your age and how active you are. However, the guideline is to aim for seven and a half hours a night. The science tells us we sleep in ninety minute cycles as this is the time you need to allow your mind and body to relax and get into ‘deep sleep.’ This is when all the good stuff happens! It is when you enter deep sleep that the body does all it’s reconditioning / maintenance work (as mentioned above). Especially important if you exercise regularly. Seven and a half hours allows you to get the optimum amount of deep sleep that your body and mind needs. What you actually sleep on is vitally important. Your mattress is the crucial component here, infact you should spend the majority of your budget (if not all of it) on your mattress. The frame isn’t important at all, you can put the mattress straight on the floor if you like but you need to get the right mattress. Personally, I don’t like my mattress too hard and I find a memory foam mattress too soft. I’ve got a pocket spring one which I love. It’s really down to personal choice and which type you feel most comfortable on. There is no hard and fast rule which is best, it’s personal preference. More expensive doesn’t mean more beneficial. If you’re sleeping on your own then anything from a single or above is fine. However, if you’re sleeping with a partner, Nick Littlehales (the author) recommends at least a super king. This is the same size as two single beds put together. Anything less is too small, you’ll be cramped and bumping into each other. The ideal is to lie on your non-dominant side (if your right handed sleep on your left side and vice versa) in the foetal position. This gives your spine optimum support and you should only sleep with one pillow. This position is also best for breathing freely. Interestingly, on a subconscious level, you’re more relaxed in this position because your dominant side is available to protect you if you’re attacked while sleeping. This goes back to caveman / cavewoman days apparently, evolution hasn’t caught up yet. This is where my problem was and this I found to be the issue with most peoples sleeping difficulties. Complete darkness is required, use blackout blinds if necessary, and absolutely no electronic gadgets emitting any light what so ever. It’s this electric ‘blue’ light that keep you awake as it causes chemical reactions that increase stress, which then obviously, keeps you awake. The ideal scenario is to go to bed at the same time each day and get up at the same time each day. Even at weekends! The human body likes nothing better than a steady routine and will respond favourably to it. If you get regular good quality sleep at set times the discipline will help you maintain the quantity of sleep you need. If you don’t get the right amount you’ll suffer. Also, going to bed late one day and waking later the next day plays havoc with your eating patterns. It will have a negative knock-on effect on your blood sugar. Your energy and concentration levels will suffer. The book recommends a ninety minute period before you retire of complete de-stressing. This will ensure you’re in a perfect state of physical and mental relaxation so you’ll sleep soundly. First, clear your head of all clutter from your day. I do this by writing notes and to do lists so my brain isn’t “buzzing” with all my issues and responsibilities from my day. I also give myself a technology curfew so I’m not absorbing any of that harmful blue light. All my tech is hidden away; iPad, phone and kindle. All my emails / texts are checked, responded too and will not be looked at again until the next morning. I’ll have a shower, put my feet up and watch telly and then, when I’m ready, I’ll hit the sack. I’ve discovered that if I don’t look at my tech I’m nodding off between the sixty / ninety minutes and I’m totally ready for bed. However, if I do check my emails, texts, etc I’m back wide awake and can sometimes be awake for hours. Again, a ninety minute period is required to make the transition from asleep to wide awake to face the day. This really works for me and wasn’t something I’d ever considered doing. If you get into a proper sleep routine you’ll find you’ll wake up at the same time and won’t be woken up by your alarm. I use the first half hour to get out of my bed, make myself a cuppa, watch the morning news and then eat my porridge together with my vitamins. After my breakfast I’ll check my texts / emails, jump in the shower, get dressed leaving thirty minutes to get out of the door and drive to work. In short; get yourself a decent mattress, go to bed and get up at the same time each day, create the right sleeping environment, sleep on your side and establish a pre and post sleep regime. Do all this and you should sleep like a baby! You should also become healthier and more productive in many different areas of your life. The main issue with all of the above guidelines is that from time to time life gets in the way. You will have late nights every so often, or for a variety of other reasons, something will knock you out of your routine. Many things may side tract you but as always, if you do the right thing most of the time then a slip up every now and again is not going to cause you too many problems. Thanks, as always, for reading. Sleep well….